This Sunday’s, UFC Fight Night 88 also known as UFC Fight Night Vegas satisfies the casual mixed martial arts fan’s thirst for Memorial Day weekend combatives action. The 12-bout fight card has flown under the radar because of its placement between UFC 198, 199, and the historic UFC 200 fight cards. The event is headlined by a bantamweight scrap between two undefeated and highly talented fighters in Team Alpha Male’s Cody Garbrant (8-0) and Brazil’s Thomas Almeida (20-0). There is no doubt that the winner of this fight could find themselves challenging for the title within the next six to twelve months. The card is stacked from start to finish, but let’s take a look at three pivotal fights and what is at stake for the fighters. 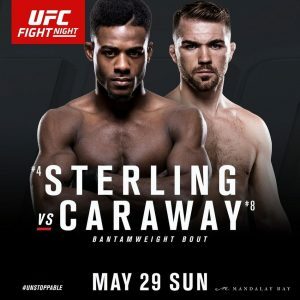 First, the UFC Fight Pass headlining bantamweight fight between Aljamain Sterling and Bryan Caraway. This is easily a pay-per-view caliber fight, however if you take a look back at recent UFC cards, the organization is taking a unique approach in featuring a bout that you would normally expect to pay for, as the headlining fight on the UFC Fight Pass portion of the card. The UFC is applying this tactic in hopes of increasing UFC Fight Pass membership purchases. Sterling, undefeated at 12-0 is a prospect out of the Serra-Longo Fight Team out of New York where he trains alongside former UFC middleweight champion Chris Weidman. He will put his undefeated streak up against a Caraway (20-7) who is riding a one-fight win-streak, a unanimous decision win over Eddie Wineland. Caraway is a very durable and tough opponent, unfortunately for him however, he is more widely associated as being the boyfriend of current UFC women’s bantamweight champion, Miesha Tate, than he is as being a top level fighter. Of Caraway’s 20 wins, 17 came by way of submission. Sterling has to be very careful that he does not let Caraway get hold of one of his neck. The majority of those submission wins were via rear-naked or guillotine choke. Sterling is no slouch on the ground either though. He trains daily alongside former UFC welterweight champion and Brazilian Jiu-Jitsu black belt, Matt Serra. Half of Sterling’s wins have come by way of submission. This fight is scheduled for three, five-minute rounds. Sterling is currently sitting at number four while Caraway is at number eight in the UFC bantamweight rankings. Sara McMann vs Jessica Eye is an extremely crucial bout in the women’s bantamweight division. Both fighters are coming off back-to-back losses and each they have a common opponent in one of those losses, Miesha Tate. McMann has had experience fighting for UFC gold as she challenged former champion Ronda Rousey for the title, losing via TKO in 2014. The Olympic Wrestler has had tough outings as of late, dropping three of her last four fights. McMann is currently ranked number six, while her opponent, Eye is ranked number seven. The two weret destined to fight one another sometime soon in order for one of them to advance in the rankings, it just so happens that the time is now and at a very crucial moment in both of their careers. With a loss, either fighter could be cut from the organization, even at a time when the UFC is trying to bulk up their female roster. Depending on the way the fight goes down, I would expect Jessica Eye to remain with the UFC even with a loss but it is not a guarantee. She is a marketable fighter and now with her teammate Stipe Miocic crowned as the UFC heavyweight champion and an entire fight card in UFC 203 being built around his hometown of Cleveland, it should be predicted that Eye will find herself on that card, fighting in front of her loyal local fans. 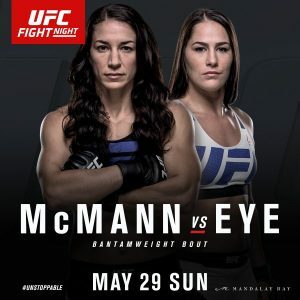 McMann will have the wrestling advantage and if she follows the same game plan as Tate did when she fought Eye, she can ride out a decision victory, however it will be difficult to take Eye down when she is using her striking to keep McMann at bay. A loss for McMann would be a major setback to her career. Again, depending on how the loser of this fight loses the fight could really define what happens next for them. The loser will likely still be ranked in the top 15 so they would not necessarily need to be cut, but three losses in a row is not a good position for any fighter to be in. 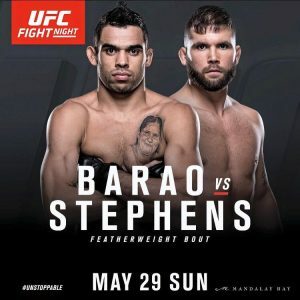 The former UFC bantamweight champion and ranked pound-for-pound fighter, Renan Barao (33-3) will make the move up one weight class to the featherweight division where he meets number nine ranked 145-pounder, Jeremy Stephens. Barao is currently the number two ranked bantamweight and made the decision to move after losing twice to now former champion T.J. Dillashaw. Barao has had weight cutting issues in the past. It will be interesting to see how he does in the new division and what he decides to do now that Dillashaw no longer holds the title. Stephens (24-12) has been with the UFC for a long time. 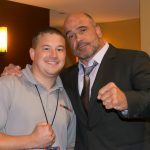 His tenure with the organization dates back to May 2007 at UFC 71. Stephens has lost three of his last four fights, all by unanimous decision. This fight determines where Barao goes, does he stay at 145, or move back to 135? But this fight also could spell the end of Stephens’ time with the UFC should he not get the victory. This is a very crucial fight for both fighters. Listen to this interview with Jeremy Stephens as he prepares for the Barao fight. Click here.